one of a pair of deep muscles of the neck and back. Arising from the nuchal ligament, the seventh cervical vertebra, and the first three or four thoracic vertebrae, it inserts in the occipital bone and the mastoid process of the temporal bone. It acts to rotate, extend, and bend the head. In long-standing cases of focal dystonia, such as spasmodic cervical torticollis, selective peripheral denervation of the sternocleidomastoid muscle, trapezius and splenius capitis muscles in the neck can lead to significant improvement in the torticollis (the Bertrand procedure). 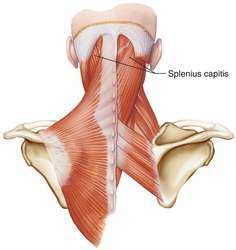 The muscular floor of the triangle comprises (from superior to inferior): splenius capitis, levator scapulae, and scalenus medius and posterior (Bruce et al 1967, Drake et al 2005, Grant and Basmajian 1965, Last 1978, Moore and Dalley 2006, Wood Jones 1953, Woodburne and Burkel 1988, Zuckerman 1961) (see Figure 1). The posterior triangle of the neck: where is scalenus anterior? 6) With respect to the occipital and cervical paraspinal regions (trapezius, splenius capitis, seminspinalis capitis), injection sites are more specific to subjective reports of pain, rather than the specific muscle.